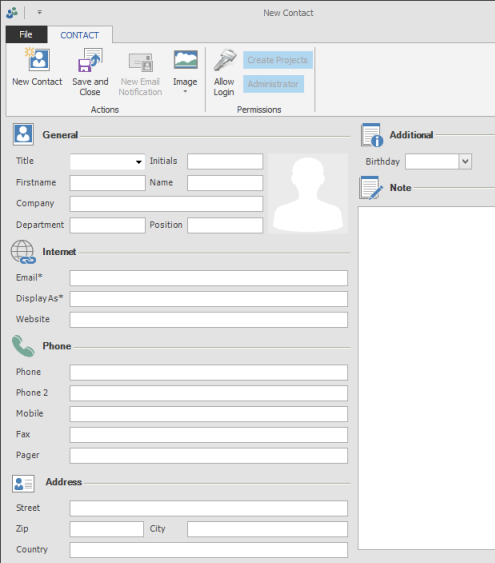 The InLoox PM contact manager gives users the possibility to create an “InLoox PM contact” for each project member, even if they are not available as Outlook or Exchange contacts. You can save the InLoox PM contacts and edit the information about people and organizations you communicate with. On the Outlook Ribbon, click the InLoox PM tab. In Outlook 2007, click InLoox PM Folder in the InLoox PM Toolbar and then Contacts in the InLoox PM project list. On the Start tab, in the New group, click New Contact. In Outlook 2007, click New Contact in the InLoox PM project list. To assign a new contact to the address book choose first an address book from the drop-down list Address Book, then click New Contact. On the Contact tab, in the Actions group, click Picture, add then click Add Picture. Browse to find the picture and double-click on it. Use also the space for the picture next to the General area. In the Internet and Phone area, enter the following information: Email, Website, Phone, Fax, Pager. Create more contacts On the Contact tab, in the Actions group, click New contact. Finish entering new contacts In the Actions group, click Save and close. Send an email notification to the contact In the Actions group, click Email notification. You will find these commands as well as the command Save on the File tab. On the Contact tab, in the Permissions group you can allow this contact to log in, and assign the basic permissions. The contact management must be activated in the InLoox PM options in order to create new contacts. For more information see Activate the contact management. How to add a contact | InLoox PM 8 • Copyright 1999-2019 © InLoox, Inc. All rights reserved.